Regardless of the degree program or vocational training you chose, you can be confident that the quality education you receive will provide you the necessary up-to-date underlying theoretical principles and knowledge needed to succeed, and that it will be combined with industry best practices that are in demand by employers today. Over 40% of 2013 accreditation survey respondents reported they received a pay raise or promotion after completing their course of study at DSU and IIEI. It isn’t enough for degrees today to be educationally sound. They must also be professionally relevant and applicable to your career. That is why all DSU degrees and courses focus on providing a firm understanding of the relevant principles, and ensure they provide practical “hands-on” relevance to your career. Anything less fails to provide our students with appropriate marketable skills and value needed to successfully compete in today’s dynamic workplace. Enroll today to experience for yourself what we mean when we say Professionally Significant Degrees®. Read some of the testimonials from students as to what this focus has meant to them. Because our school has “Open enrollment” you can enroll in your first class immediately without waiting to be admitted into a degree program. Simply click on the Classes Starting Soon button below and select a class start date and register. Unsure? Questions? 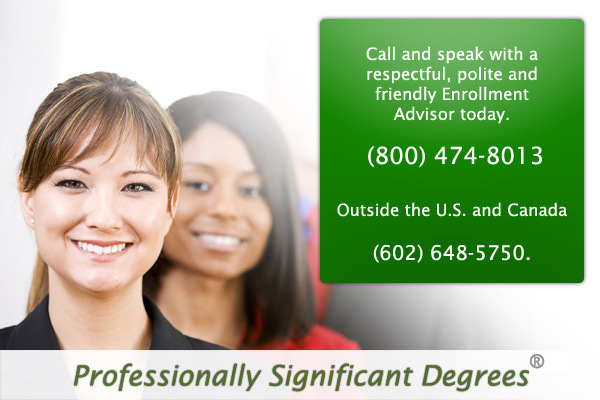 Call and speak with a respectful, polite and friendly Enrollment Advisor today. You’ll be glad you did. If instead you would like us to email or mail you information, click on the request information button. We’ll be pleased to answer all your questions and help you meet your education and training goals.